On the market now, after many years, is the spatial wonderland he crafted forty years ago for the Phillips family of Glenfield: the ‘green house,’ as it was dubbed, for its colour (which now appears the very least of the colours used!). Inserted into lush bush at the end of a cul-de-sac, this project employs a number of characteristic Megson elements. The base of the house is formed from concrete blocks,with interiors on six-half levels cascading down under an inclined glass roof. Enclosing this is a highly complex composition of “periscope” forms – arranged both vertically and horizontally - that recall the Rees Townhouses, but which are painted a lush green – hence the project being referred to as the “Green House”. Projecting out into the bush on the downhill side of the house is balcony composed as a cantilevered cage of steel pipe, a motif that would reappear in Megson’s own house. Architecturally fabulous and with all the elements of a truly special home, this unique property was designed by the renowned architect Claude Megson and built to admire the nature of the magical Scenic Reserve setting. Our current owners bought this jewel in April 2000 recognising the beauty of the design, the exquisite location among native trees and the convenience of being at just 10 min drive [ahem – Ed.] to Auckland CBD. This fabulous property is set on a 1113m² (approx) section and features 3 bedrooms and 3 living areas on six-half levels cascading down under an inclined glass roof that spills light into and throughout the home. The attention to detail creates a home with a blend of quiet intimate rooms to dramatic areas under the vaulted ceiling, very different from what we are all used to see in the Market. To absorb the resulting arrangement of spaces, with a gentle division of activities suggested for each of these areas, the first time spectator must spend time roaming the home, revisiting rooms, to understand the feeling and the flavour of each area. The home is centred around the outdoor and indoor living areas, that inspires to entertain, to invite people to lounge on the open space; long lazy Sunday lunches or formal occasions would all be enhanced by this serene and very private environment. There are areas for reading, to retreat to, to reflect, to gather with friends and discuss matters of great importance, or to simply absorb the peace of the view of the beautiful Kelmar Scenic Reserve. Walking down the driveway and looking back to the home, you cannot help feeling inspired with Claude's creation; the current owners have lovingly looked after this home over the years but it is time to hand the mantle onto another owner who will thrive in this exceptional home. The house has Open Homes this Saturday and Sunday. 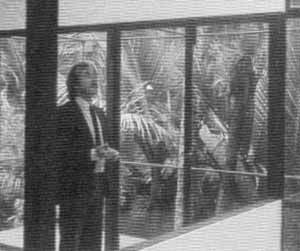 Architect Claude Megson in his “green house” soon after completion.